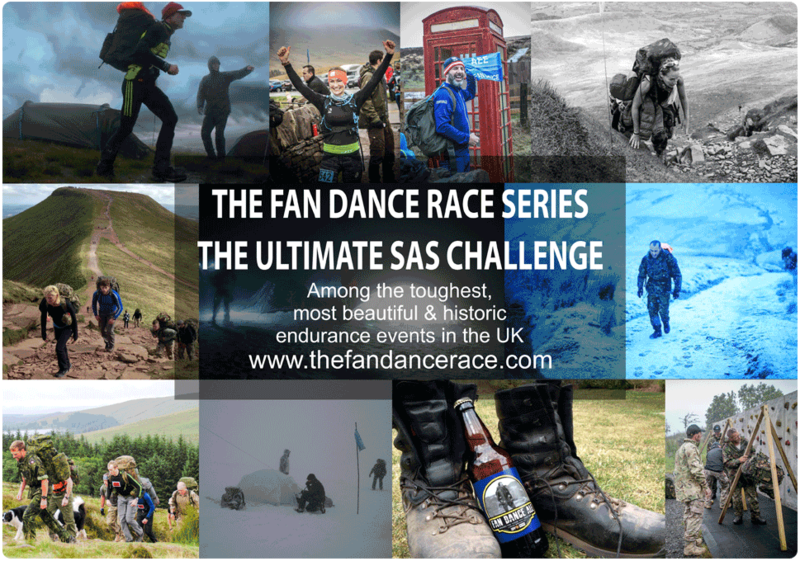 The page is your Fan Dance resource for Key Timings & Locations, event categories and requirements, weight limits, route info and mountain safety. Relevant information on other events can be found on associated pages under the EVENTS tab. The Fan Dance Base Camp and all event administration will be at The Storey Arms Centre. Race start / finish point will be at the old red phone box next to the Storey Arms Centre. The Load Bearing category requires “Fan Dancers” to carry a weighted Bergen/rucksack and be self-sustained for the duration of the march. The Load Bearer’s Bergen/pack must meet the stipulated weight requirements (see below) and must not be made up of “dead weight.” The load must be made up of useful mountain safety items which will be provided in detail through email information updates. The Fan Dance Load Bearer must wear boots (military or civilian trekking type) for both summer and winter editions. Clean Fatigue is a military term of reference for parachuting without equipment. In the context of the Fan Dance it means that runners do not have to meet heavy weight carrying requirements as per the Load Bearing edition. This format is designed for fell and trail runners, those looking to experience the Fan Dance before committing to the Load Bearing category, and generally, anyone who doesn’t fancy wearing boots and carrying a house on their back. Clean Fatigue runners are still required to carry a small pack containing specified basic provisions which will be provided in detail through email information pack. The Clean Fatigue Fan Dancer can wear trail/fell running shoes but normal running trainers will not be permitted. Upon completing registration, the official AEE Clean Fatigue Clothing & Equipment list will be dispatched via email. Load Bearers are to assemble at the DS (Directing Staff) manned weigh stations at pre-race registration. Before being issued an event number you will be required to have your Bergen/pack and footwear inspected by Directing Staff and tagged as fit to march. There will be a practice scale for you to self-test prior to the official weigh in. Weight checks may be carried out at random points throughout the course and at the finish. Failure to meet weight requirements at any point results in being withdrawn from the official timekeeping and results. The days of carrying paint numbered bricks are long gone. Make sure your load is composed of useful items like emergency rations, waterproofs, spare clothes, a sleeping bag and anything else you would normally take for a day in the mountains. Allow extra weight to compensate for the food and water you will require during the march to ensure your load is always at or above the minimum weight requirements. If you do not feel you are capable of completing the event with heavy weight but wish to take part consider the Clean Fatigue category as this requirement is waived. The Directing Staff team are all former members of the SAS and SBS and are responsible for overseeing all matters related to mountain safety. Our Special Forces instructors are supported by a dedicated Mountain Safety Team (MST) which possesses vast experience from their tri services and civilian professional backgrounds. Despite the considerable demands of the Fan Dance you’re in safe hands on the high hills with AEE. Our organisation has an unblemished safety record operating in the most extreme environments and adverse weather conditions in the UK and on a wider global level. In our arsenal we possess the UK’s first and only internal event mountain rescue team, a dedicated patron radio network, and the highest grade of medical cover, providing an unrivalled concession free SAS Selection experience in the Brecon Beacons. The Fan Dance is a non-navigational exercise with the route fully way-marked by flags and direction arrows with members of our Mountain Safety Team and Directing Staff providing additional cover at all junctions and hazardous segments. A Fan Dance specific route map section with easily identifiable key features and colour coded location segments will be issued along with an event safety card. Along the route you will pass through a series of DS manned rendezvous points. You will be required to log in with the DS to have your name and race number recorded and your suitability to continue assessed. The same RV procedure is employed by the DS on the real SAS/SBS Selection course and is in place for safety reasons. It is therefore essential that you pass through each RV point and adhere to the measures in place. RV procedure applies to both Load Bearing and Clean Fatigue participants. You will be provided detailed instructions on proper RV protocol through email information updates. Note: The DS manning the RV points are there to help you. If you have any questions, concerns, injuries, incidents to report, or are simply unsure of where to go next, the DS will help you and offer any assistance as is necessary. AEE are active on numerous social media platforms. Our Facebook ,Twitter and Instagram pages serve as great information sharing platforms and allows for the quick and effective distribution of news, images and event updates. The most valuable resource will be your fellow Fan Dancers who have a combination of military and civilian outdoor experience. All the top tips from the DS and previous Fan Dance editions can be found on these social media pages.